Thank you for your interest in advertising with TheBestOnlineAds.com! TheBestOnlineAds.com is a division of OneOfaKindAntiques.com and PriceMyItem.com�and provides internet users with information about various subject matters. We operate numerous informational websites and offer businesses the opportunity to advertise on any of these websites. It affords your business access to�specific target audiences! via a text link in the left navigation area. 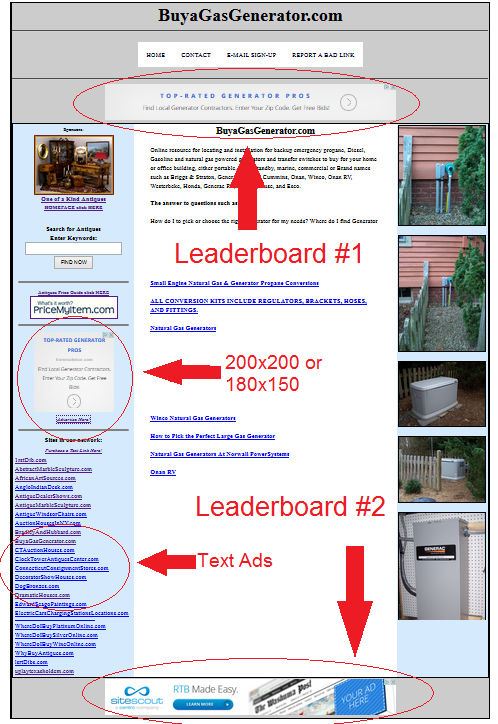 A Leaderboard Ad will display your ad at either the top or the bottom (or both) position(s)�on the page. You will need to provide a single 728x60 graphic (animated .gif is acceptable; 45k max weight) and a link for users to be directed to your site. All materials and links are subject to approval by One Of A Kind Antiques management. Terms: The minimum advertising term for a Leaderboard ad is one (1) month. Cost is 0 per month per informational site. You may choose to advertise on any (or on as many) of the informational sites we have (see list below). We can immediately begin your advertising�campaign, as long as there are no paid leaderboard advertisers currently on the site(s) of your choosing. Order a Leaderboard Ad Now! If you would like to advertise in the left navigation area, we provide a 200x200 square or an IAB-compliant 180x150 rectangle advertising slot. You are required to provide the graphic (animated .gif is acceptable; maximum weight: 45k) and a link for users to be directed to your site. All materials and links are subject to approval by OneOfaKindAntiques.com management. Terms: The minimum advertising term for the left navigation area is one (1) month. Cost is per month per informational site. You may choose to advertise on any (or on as many) of the informational sites we have available (see list below). We can immediately begin your advertising�campaign, as long as there are no paid left navaigation square advertisers currently on the site(s) of your choosing. Order a Left Navigation Ad Now! We offer a Text Link service where you can simply have a text link to your website appear on ALL of our informational websites. By choosing this option, a link to your website will be displayed on ALL of our informational websites! �We have hundreds of sites that we are currently developing and making live on a daily basis. Your text link will be added to each informational site that we launch for the duration of your term. There is no need to request inclusion on new sites! Terms: The minimum term for a text link is three (3) months at a cost of /month ( minimum). Please see the list of websites below to see where your website will be listed. Order Text Link Placement Now! All requests for advertising must be prepaid for the entire term as outlined above under each option. Once your campaign starts, there will be NO REFUNDS. Payments can be made via Paypal or credit card. Please Contact Us if you have ANY questions. Copyright © 2019 TheBestOnlineAds.com (a division of One of a Kind Antiques, LLC), all Rights Reserved.